This may knock my foodie credibility a bit with some factions, but I have to admit I've never been the biggest fan of Spanish cuisine. 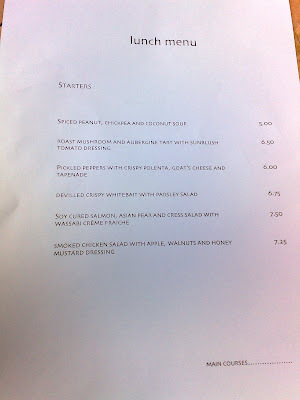 I've had the odd pleasant meal here and there, and who doesn't like a bit of chorizo or croquetta every now and again. 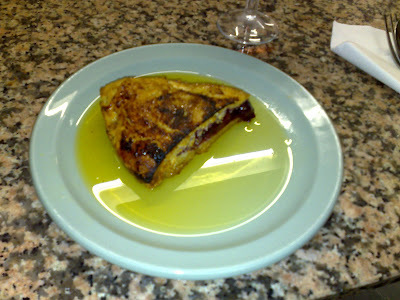 But where French food has the ability to be both sophisticated and flavourful, Spanish is either fussy and bland or soaked in oil and salt and hugely overpowering. This is a generalisation of course, and I probably haven't tried the best either here or abroad, but give me La Trompette over Barrafina any day. Cheese, however, is another thing entirely. It seems that anyone, even - shock horror! 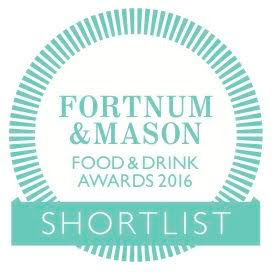 - a Brit, can knuckle down and make a fantastic cheese given enough time, passion and energy. Some of my favourite cheeses recently have been Spanish, and in trying to figure out why this is I've started thinking that perhaps some of the things that make Spanish cuisine as a whole unappealing to me - the overseasoning, the relatively unsophisticated balancing of flavours - are exactly the reasons that their cheesemakers appear to be able to take bigger risks and produce more exciting cheeses than elsewhere. 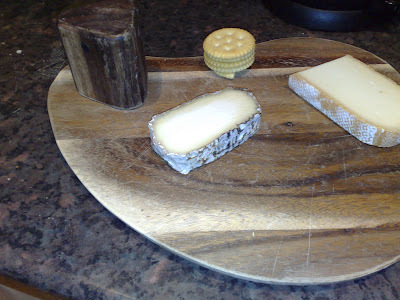 Monte Enebro is, first of all, a visually appealing cheese, a goat's with a lovely dry-ash rind (the same mould, I'm told, as used in Roquefort) and a subtle ring of slightly darker flesh whitening and becoming more opaque towards the middle. It's powerful, salty and acidic but with a satisfying smooth flesh and the little bits of gritty ash from the rind provide an extra crunchy texture. It's made from pasturised milk, and as such is a very approachable cheese, but it just lacks that extra 'farmy' taste that you can sometimes get from unpasturised milk. However it's certainly more interesting than something like a Valençay, which is made from unpasturised milk, so they must be doing something right. What shouldn't be a surprise to learn by now is that Monte Enebro is handmade by retired builder turned artisan cheesemaker Rafael Baez and his daughter Paloma, who for 25 years have shipped their product from their base in Avila to all around the world. For all good cheeses - all my favourites, at least - more important than pasturised vs. unpasturised, large vs. small batches and goat's vs. cow's milk is that individual attention and love of the craft shines through. A few weeks ago I issued a challenge to the good food-loving people of the internet to find me a decent, mid-range Italian restaurant. I was just looking for somewhere sensible between the exemplary ingredients and stratospheric pricing of the River Café and the high street dross of Bella Pasta - I needed convincing that Italian restaurants are occasionally worth bothering with in London. 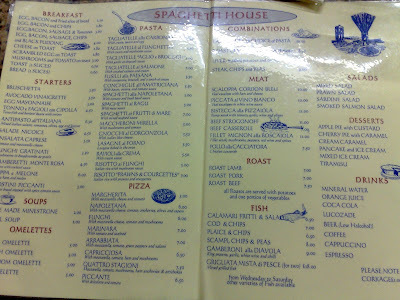 So off the back of one particular recommendation (thanks Annemarie), I found myself travelling all the way up to Tufnell Park after work on Thursday to a little place called Spaghetti House. It's a bit of a local institution apparently; the chef, Enzo, has been here manning the stoves (and the phones when I called) for over 20 years and runs the place single-handedly - when he's ill or on holiday, it's closed. This is clearly not someone from the Gordon Ramsay school of restaurant management. From the outside it looks like your average greasy spoon caff (out of interest, why are they called 'greasy spoon'? What on earth could you be eating with a spoon that was greasy? Suggestions please), inside the décor struck that fine balance between 'homely' and 'bonkers'. 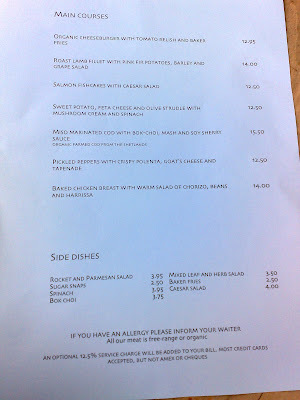 The laminated menu was tempting in its simplicity, but the list of specials appeared to go on and on and was scrawled in chalk in every available gap of wall space. Assorted paraphernalia dangled from the ceiling, a sign by the door said 'welcome' in 20 world languages, and just the other side of a tiki-bar façade there indeed was Enzo, working feverishly away amidst the noise and steam of the kitchen. At such ludicrously low prices it would have been churlish of me not to try and sample as much as I could, so I ordered a starter and dessert, very unlike me. 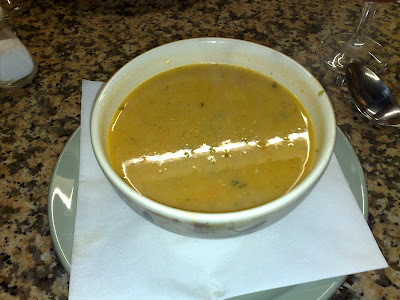 The home-made minestrone soup was hearty and huge, if a little bland, but who's complaining at £2 a pop. 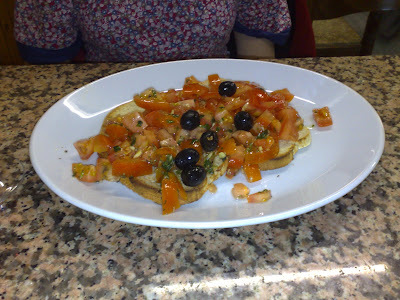 A friend pushed the boat out with a bruschetta at £3.50, which was much nicer, dressed with a lovely rich tomato salsa. 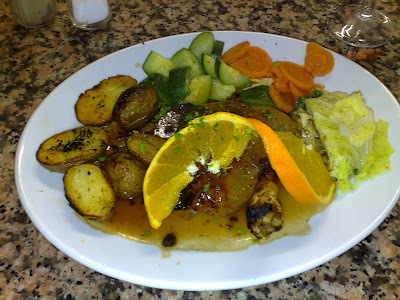 The roast duck main course was generous in flavour and portion, with a thick orangey sauce and nice fatty meat. It's not haute cuisine by any means, just boiled veg and roast potatoes with seared duck leg, but it was actually rather good, and not just because it cost £8. 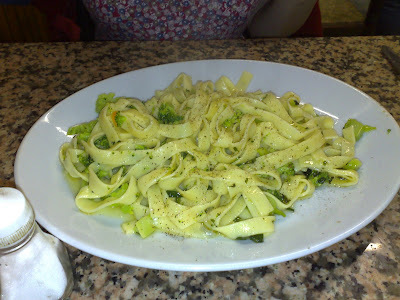 I did try a bit of my friend's broccoli pasta (£5) and yes, that was pretty good too. No better than you could make yourself, admittedly, but comforting and simple and - and this is worth repeating - £5 for a huge plate of food. 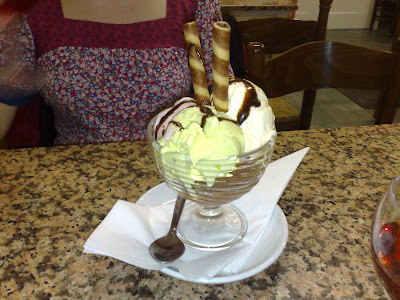 Ice cream also came in a gut-bursting portion size, as did a pleasant enough slab of cherry pie which could have done with a bit more warming through but, stuffed with gloopy fruit and sprinkled with sugar, didn't last long anyway. 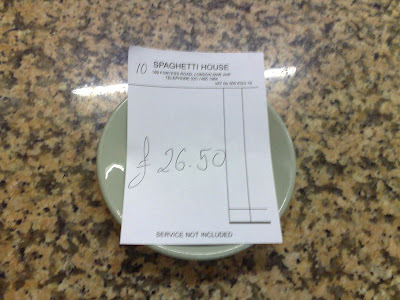 So after moaning about the dearth of affordable decent Italian restaurants in London I appear to have found something of a rare commodity - a genuine restaurant bargain. To be fair, not every Londoner is likely to travel up to Tuffnel Park for a bruschetta but judging by the clientele on Thursday night, word probably doesn't need to travel much further than NW5 for every table to be taken. And on the subject of the clientele, I have never seen a more delightfully complete section of society in one restaurant - a table of septuagenarians, a young professional couple, cabbies, families, it felt almost contrived, like I was eating on the set of a soap opera. I do have one complaint though. After the main courses were served, the waitress came over with a black pepper mill. Part of me wanted to wrestle it off her, but as I was enjoying the evening so much I waited patiently as she seasoned the plate in front of me. Unconventional and quirky in so many ways, I will allow Spaghetti House this one pretention. It doesn't seem to be doing it any harm. 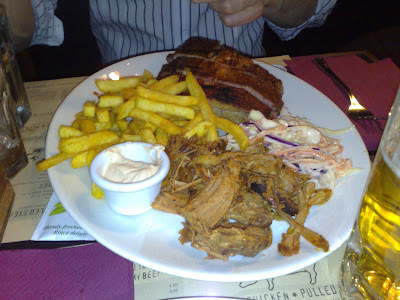 The problem with steakhouses and BBQ joints in the UK, and it's a big problem, is that the raw meat ingredients are either too expensive to appeal to anything more than a handful of obsessed foodies, or cheap enough but of inferior quality and therefore undesirable for a different reason. Take Hawksmoor, for example, a brave and unashamedly premium steakhouse on Commercial Road. The quality of the meat is exemplary (The Ginger Pig of Borough Market fame, no less), the skill of the kitchen unquestionable, the service professional and knowledgeable. But at £50 a head on average without wine it's not hard to see why you're not about to see a Hawksmoor on every British high-street - or anywhere outside London for that matter. Right at the other end of the scale, there are dives like Garfunkels and Angus Steakhouse where you can get a "steak" for around a tenner, but if you consider that this price includes a profit for the restaurant, you're looking at a seriously inferior piece of cow. If indeed you can even be sure it is cow. Over at über-bloggers Dos Hermanos, there's a mouthwatering post about a 40-day aged forerib of Aberdeen Angus beef from Ireland, which looks irresistably tempting until you realise that piece of beef for one person cost £20 from the butcher. Good meat isn't, neither should it be, cheap, and this is why good, reasonably-priced steakhouses may always remain a largely (North and South) American phenomenon. That doesn't mean, however, that there aren't a handful of restaurants attempting to walk that fine line between good meat and reasonable value. 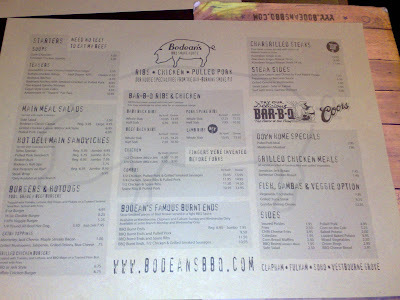 I have mentioned Bodean's before because I have been to their Clapham branch a couple of times and been very impressed with a number of items on the menu. I was completely expecting this to be a gushing puff-piece about how it is possible to get consistently good US-style BBQ food for less than stellar prices and how I can't understand why there isn't a Bodean's on every street corner. And yet last night a trip to Bodean's in Soho served as a reminder that this goal remains a long way off. Perhaps we just visited on the wrong night. The "Famous Burnt Ends" are served Monday and Wednesday only - we were there on a Tuesday. Perhaps they have a different chef on the quiet nights, and don't try as hard, I don't know. 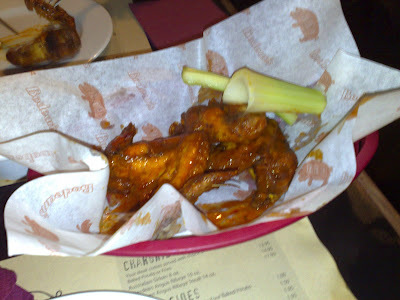 But although our buffalo chicken wings were as gorgeous as ever in a hot vinegary sauce and cheesy dip, and the half slab of pork spare ribs were juicy and satisfying to pull off the bone, the pulled pork was just dire - dry, tasteless and chewy, completely unlike the plate of moist pig meat I'd had before in Clapham. 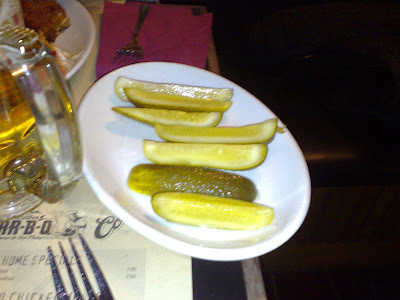 Pickels were OK but strangely fizzy, like they were past their best. I know they can do much better, and have done much better, but if they can't produce the goods on a regular basis then I can't recommend them. So there's only one thing for it - as soon as the weather looks like it's turning for the better, I'm replacing my £14 Argos barbeque (don't laugh - it's lasted three years and served me well) and going down to Dove's on Northcote Road for a bag full of the finest meat in South London. If you want something done properly, do it yourself. P.S. Many thanks to Guy of Alltop food for adding me to their comprehensive list. If you want a neat roundup of all the best food blogging sites, pay them a visit. Ah, niche ethnic restaurants - don't you just love them? Vast, incomprehensible menus, grumpy staff, bizarre decor. Cây Tre has all this in spades, but warranted a visit from me due to some favourable reports in the right places, and even a recommendation from a friend who had raved about their soft-shelled crabs. Soft-shelled crab isn't something you see very often in this country, although it is quite popular abroad, particularly the States. Maybe the British just need a little more convincing that you really can eat the whole thing, shell and all. I admit even I was dubious the first time - it's a bit like drinking a cup of coffee and then eating the cup. Takes a bit of getting used to. 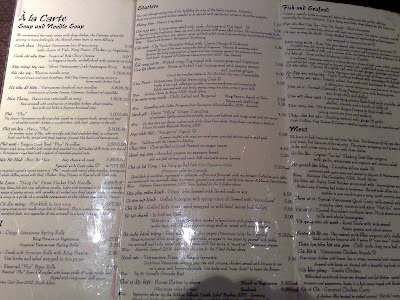 Look at this menu - it was actually double-sided and there were just as many dishes on the back as well. It's what Gordon Ramsay would call "terrifying", and although large menus seem to be the norm in most East Asian restaurants, this was even more frightening than most, especially when you started to read it closely - "Crab-Asparagus soup", "Wicked crispy Fog", "Sea snail with knotweed" jostled for attention on the laminated pages. In the end, we crossed our fingers and ordered the soft-shell crab, the scallops, some noodle dishes and the king prawn Summer Rolls. First, the good. The summer roll was cold (I would have preferred it warm), but contained enjoyable texture contrasts (soft on the outside, crunchy in the middle) even if it was a little bland in flavour. The soft-shell crab was lovely, juicy and pretty to look at and matched well with a strong soy sauce. But things went rapidly downhill after that. The scallops were almost definitely not fresh and came in a horrible gloopy grey sauce that brought to mind cheap Chinese takeaway. Something called a Vietnamese Pizza looked impressive enough on the plate but was dripping with grease and actually pretty bland once the novelty factor wore off (which was almost immediately). There was another nondescript plate of fried veg, and a little tray of OK noodles, but nothing so interesting as to be worth lingering over. Even the prawn crackers were bog-standard. 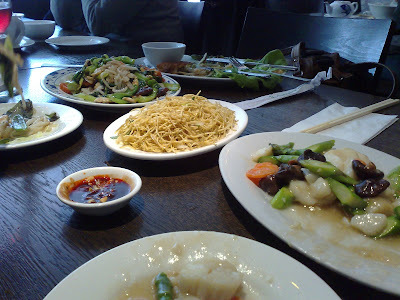 After I'd stuffed my face with as much wobbly gluey scallops and fried noodles as I could keep down, I decided to admit defeat, with quite a bit left on each plate. So, the portions are generous, but what's the point if the food is a chore? 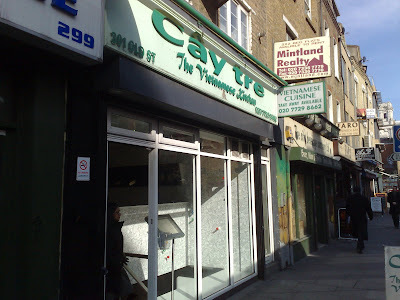 Cây Tre, the odd "house speciality" aside, is little more than a mediocre high street Chinese and I'm baffled as to how it's won over so many admirers. As should be perfectly apparent to any regular readers of this blog, I am no photographer. 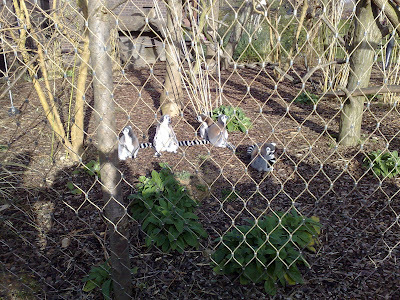 It's pushing the limits of my meagre ability just taking an in-focus shot of an immobile plate of food three feet from my face, so whilst for many people a trip to London Zoo would provide a bounty of photogenic opportunity, the best I could manage was a slightly blurry shot of a group of lazy lemurs, barely recognisable behind thick chicken wire. I do possess other skills, however - not least the ability to sniff out a gastropub within half a mile, and so as the queue for the zoo stretched halfway down Albert Road at 1:30 on Saturday afternoon, I suggested we have lunch first and give the crowds a chance to dissipate. 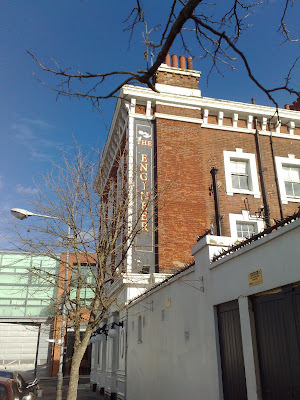 The Engineer is a handsome, rather eclectically decorated pub in the handsome, eclectic neighbourhood of Primrose Hill. Staff were cheery and slightly hippified, in keeping with the area, and the menu followed suit, containing a variety of standard gastropub ingredients (chicken breast, cod, lamb) served with some less-than-standard sides (harissa, bok choi and mash, barley and grape salad). It was tempting stuff, and our rickety little corner table was beginning to feel very much like home as I sipped on a pint of Hook Norton ale and gazed out over the well-heeled crowd. It being only lunchtime, and mindful of the looming £15 zoo entrance fee (that place goes up by £5 every year, I swear), we had one course each. As you can see, my lamb fillet was nothing if not a pretty plate of food, coloured by pomegranete seeds and flecks of chilli, and the meat itself was rich and tasty with nicely roasted potatoes. 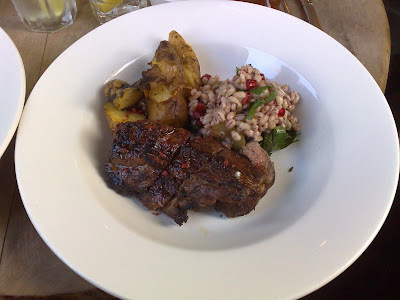 But the barley and grape salad was, as you might have already decided, perhaps just a little into 'weird' territory. Not quite enough to stop me wolfing down the whole lot, obviously, but nothing I would go out of my way to recreate at home or order again somewhere else. I need dishes like this though occasionally, just to be reassured that some people are brave enough to try new flavour combinations, otherwise you'd just end up being offered the same stuff everywhere. So well done The Engineer - your barley and grape salad is wrong, but don't stop trying. We did eventually make it to the zoo, and despite the price rise it's still one of my favourite ways of spending a sunny afternoon. In summer they have a hugely overpriced BBQ set up near the penguins, serving many of the animals you're paying to go and see roasted inside a sesame seed bun. It's a slightly surreal experience, and one guaranteed to set your moral compass spinning, so I would recommend following your own gastro radar some place else if you're need of sustenance. There's no shortage of options, and I can thoroughly recommend the Engineer at the very least.